A great warrior should showcase their skill in battle by wearing proof of their prowess. 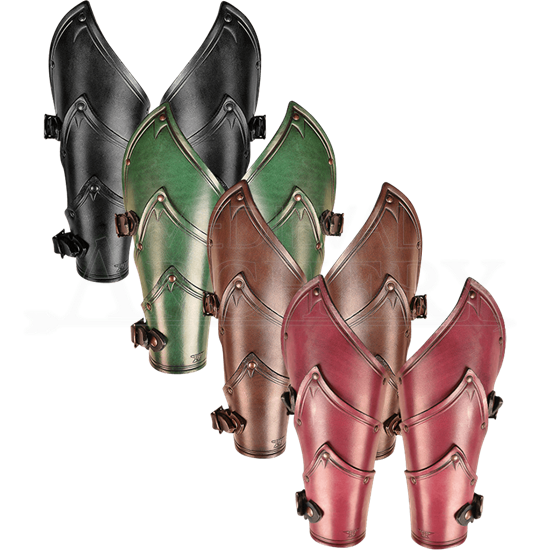 The Alistair Bracers look as if they were created with dragon scales or forest leaves. An elven archer or dragon slayer may buy these leather bracers in one of four colors. These bracers are riveted in three overlapping segments with buckles and straps to secure them to the arms. The asymmetric curves and ornamental embossing give the bracers their mystical appearance. As a set of two, they are ideal for a fantasy or medieval convention or a LARP event.